Over the past several decades a better understanding of psoriatic arthritis and new medications have had a major impact on relieving pain for those who suffer from it. But unfortunately, less attention has been paid to some of the other conditions that often accompany psoriatic arthritis. If you have this form of arthritis and are experiencing fatigue, sleep problems, mental health problems or other psychological issues – you aren’t alone. Rheumatologist Elaine Husni, MD, MPH, shines light on some of the other issues surrounding psoriatic arthritis. Psoriatic arthritis is an inflammatory type of arthritis that affects up to one-third of people with the skin condition psoriasis. These are autoimmune diseases, in which the body’s immune system mistakenly attacks healthy tissue. Psoriasis causes patches of red skin with silvery scales. With psoriatic arthritis, the immune system attacks joints and the places where tendons and ligaments attach to bone, causing inflammation and pain. Skin symptoms usually begin years before joint symptoms. But skin and joint symptoms may appear at the same time. Psoriatic arthritis strikes men and women equally, usually between the ages of 30 and 50, unlike rheumatoid arthritis, which affects more women than men. Living with any chronic disease presents challenges, but research has pinpointed that those who suffer from psoriatic arthritis have a particular difficult time, especially when it comes to psychosocial and mental health. “The most common issues are sleep disorders, fatigue, low-level stress, mood disorders and reduced work productivity,” says Dr. Husni. Not everyone experiences these, but for those who do they should not be ignored. Lack of sleep, low energy and depression can cause people to withdraw from activities they usually enjoy, which may lead to social isolation. Pain, fatigue and anxiety can contribute to lost days of work and lower productivity while at work. Not only do these issues negatively impact quality of life, they can set up a vicious cycle. 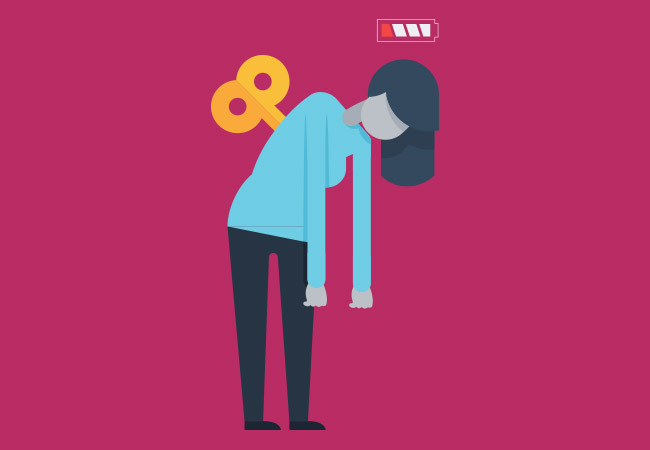 Fatigue and a desire to hide psoriasis may lead to less physical activity. But physical activity is an important part of treatment. It has also been shown that repeated nights of poor sleep can worsen the pain of arthritis, which further disrupts sleep. Increased pain may be treated by raising the dose of a medication or changing to a different one. But this may not be necessary if the other problems are addressed. “Once these psychological issues are recognized they can be properly treated,” says Dr. Husni. “I want patients to understand that mood disorders, poor sleep, fatigue and other related issues can negatively impact their disease, and they should discuss them with their rheumatologist, and also with their primary care doctor,” says Dr. Husni. Addressing these issues will improve the overall treatment of psoriatic arthritis. It may require taking additional medications, such as antidepressants, or seeing other medical specialists in addition to your rheumatologist. A sleep specialist or mental health professional may also be consulted.